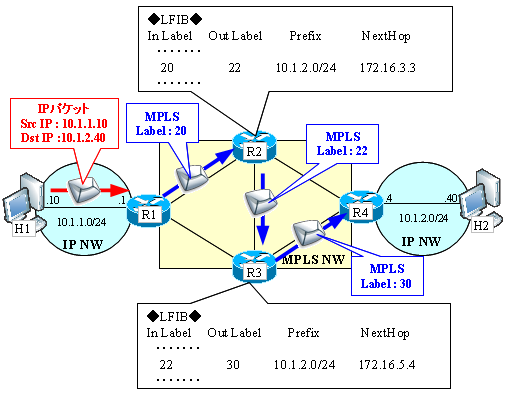 PHP and stands for Penultimate Hop Popping, is a feature to streamline MPLS communications. Routers at the boundary of the MPLS NW and IP NW is, at the same time as the role of the Ingress LSR, there is also the role of the Egress LSR to the function of the reverse.Egress LSR is that of the router to forward the packet to the MPLS NW to IP NW. If you are not using the PHP function, in the Egress LSR, the destination of the label information Next Hop is the IP NW is transmitted to the LSR around by the LDP and the like in the normal label (16 or more).  For example, we look Consider the following example. In this case, in order to receive a packet with a label in the R4, you first look at the LFIB table. For the LFIB table the label is written and please Pop (Delete) to delete the label.And then, to find the routing destination to see the FIB table.In other words, become a twice effort, it takes that much load on the router. 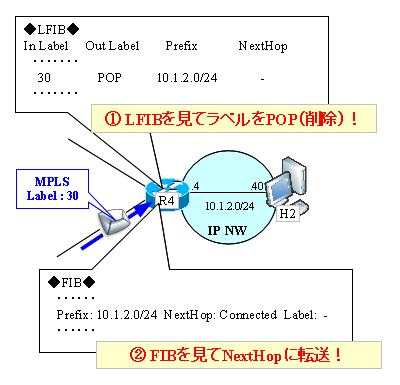 Because the destination is a Connected in the example shown, but goes directly to the destination, if tentatively 10.1.2.0/24 is not Connected, the FIB table contains the specific IP address for the NextHop, the NextHop by FIB table It will be transferred to. If you use a PHP function, in the Egress LSR, the destination of the label information Next Hop is the IP NW is, Implicit Null by the LDP or the like (label: 3) and is transmitted to the LSR around a special label called. In this case, in order to remove the label when sending to R3 in R4, you will receive a packet with no label in R4.Therefore, unlike the case of no PHP function, because from the beginning it is referring to packet transfer the FIB table, it will be efficient.